The little town of Harpers Ferry wedges itself into the foothills of the Blue Ridge Mountains at West Virginia’s northeastern border. Its stunning natural setting and rich historical value make it a popular stop for tourists. John Brown’s 1859 raid on the local Armory and the event’s influence on the Civil War give this tiny town national significance. 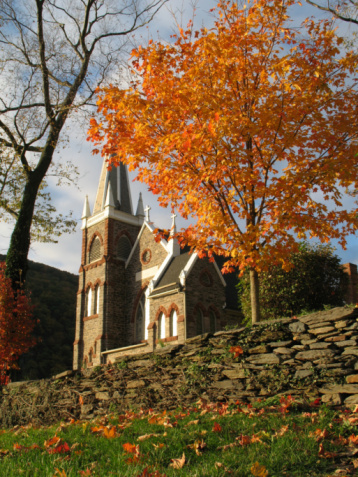 Learn more through guided living history tours at the Harpers Ferry National Historical Park. Here you’ll find the confluence of two mighty rivers and a mighty trail. The Potomac and Shenandoah Rivers join in this low-lying valley. On any given hike through the wetlands, you might spot a great blue heron or a painted turtle. You can also hike the famous Appalachian Trail for even more wildlife sightings. Click here to read the full article of "Destination: Appalachian Highlands," which gives other great places to visit in West Virginia.